The use of Chinese exercise balls is based on the theory of jing luo (merdians) and xue (acupuncture points). Two or more balls are placed in the palm and manipulated by the hand and fingers. As the balls are rotated clockwise and counter-clockwise, manipulated by your finger movements, vital acupuncture points in the hand are stimulated. Exercising with Chinese health balls is intended to restore energy and blood flow to the brain, muscle, and bones, and as a result, improve overall health and ultimately prolong life. According to Chinese medicine, the ten fingers are connected to the cranial nerve, and the body's vital organs (heart, liver, spleen, lungs, kidneys, gallbladder, and stomach). 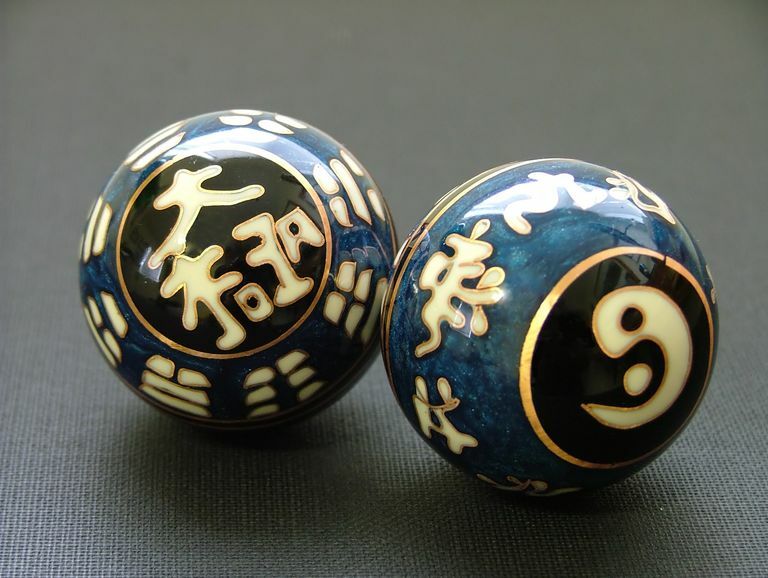 Traditional Chinese exercise balls date back to the Ming Dynasty (1368-1644). Original balls were solid. Later the balls were made hollow and were generally made from metal. Sounding plates are housed inside a paired set of metal exercise balls creating chime sounds when they are handled. One sounds high representing "yin" and the other sounds low representing "yang." Today you can find a variety of exercise balls sculpted from different mediums (wood, metal, and stone). Many of them are quite beautiful and have artistic value. Metal balls are the most commonly used for exercise because they are the most durable, and the metal health balls are also considered to be the more therapeutic in general. Chinese exercise balls typically are sold in pairs. It's recommended for children to use the balls measuring 30 millimeters while tall adults can rely on the balls measuring up to 60 millimeters. For an average woman, 35mm to 40mm balls are recommended and 40 to 50 mm balls are suggested for an average man. Smaller balls are recommended if you wish to advance your exercise by manipulating 3, 4, or even 5 balls together in your hand. The Chinese philosophy of complementary aspects of the body/mind to be achieved (be in balance) for optimum health and well-being. Yin reflects the passive, non-moving, and feminine energies. Yang, the more dominant energy reflects the active, moving and masculine energies. The pairing of yin and yang symbolizes opposing energies (feminine and masculine) melding together to complete the whole circle.